Lenovo has introduced a new range of laptops that can fold over and beyond 180-degrees, but instead of re-using the “Yoga” name, they call it “Flex”. Here’s a brief comparison between the 2 product ranges. Unlike Yoga, the Flex can only fold outward up to 300-degrees in a stand mode. Since the Flex can only be used in one direction, the screen does not have orientation mode. Once converted into stand mode, the keyboard automatically locks to prevent accidental key entries. Yoga ultrabook is thin and lightweight. Flex 14 appears more like a normal laptop with thick hinges. It also weighs a hefty 2kg and 21.5mm thick. With the 14-inch screen, the Flex 14 offers a more comfortable viewing, but as the resolution remains at 1600×900 like the smaller Yoga, its pixelation is quite obvious. I also felt that the screen quality is not on par with the Yoga. Good thing the glass panel reflectivity is quite low compared to other laptops. The touchscreen sensitivity is adequate. I don’t feel any sense of frustration when using it. Just like a traditional laptop, the Flex 14 battery is removable. Not that you need to, since the Flex 14 battery operation outlasts Yoga about 2-fold. Lenovo learns from the Yoga and designed the Flex 14 to be more sensible. First, the hinge is thickened in order to elevate the Flex 14 when folded in stand mode. Some rubber pads are also placed at the corners so that the keyboard area does not touch the table surface. While the Yoga speakers are hidden underneath the keyboard, the Flex 14 speakers are located below the laptop spaced out to both sides. This design allows audio to be heard even when you place the Flex 14 on your lap. Better still, when you flip the Flex 14 to the stand mode, the speakers are faced upwards, resulting in clear sound. Using Dolby Advanced Audio processor, you can boost the loudness and adjust the frequency equalizer to achieve rather impressive sound. The trackpad is a smooth surface that you can glide your fingers with ease. There is this gesture that lets you scroll indefinitely: use 2 fingers to slide from the middle to the edge of the trackpad. A slight problem though: I find myself keep activating the trackpad accidentally while typing. Fortunately, I could easily disable with a shortcut key. Unlike Yoga where the SD card fits right into the slot, the SD slot on the Flex 14 is shallow so the SD card sticks out. This means you cannot keep the SD card permanently in the slot for storage. Lenovo pre-installs an app to help manage your battery lifespan. Presented like a car dashboard, the app informs you of your remaining battery power and how to optimise the charge as well as the longevity of the battery. It is interesting why Lenovo creates a special app to educate consumers about conditioning the battery. Running with traditional hard disk drive (HDD) instead of solid state drive (SSD), the Flex 14 might not feel as fast as the Yoga, but nonetheless it still starts up rather quick. The benchmark is nothing super but the new 4th-generation Intel processor consumes a lot less power which extends your battery life. 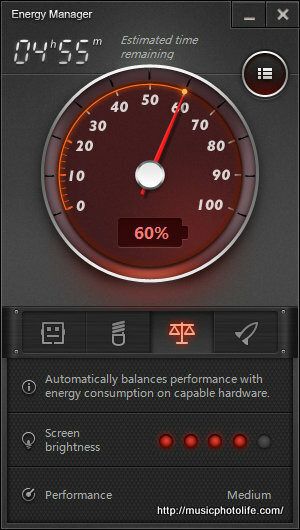 I highly recommend you select SSD if options are available, it will improve performance and extend battery life further. A small price to pay for an overall better experience. Flex 14 is priced from S$999, while Windows 8 Yoga 13 is at least 50% more. The Lenovo Flex 14 works and feels just like a normal 14-inch laptop, with the added feature of a stand mode and a long battery life. It feels sturdy and looks contemporary with orange accents. If you do not really need the portability of the Yoga or the fold-flat tablet mode, the Flex 14 is a value-for-money product from a brand known for its great keyboard and quality build.